Unlike the Wednesday CBS and NBC evening newscasts, ABC's World News highlighted a favorable development in Iraqi political progress as anchor Charles Gibson gave 20 seconds to: "Overseas, in Iraq, a breakthrough for the country's government that has been so often criticized. Iraq's parliament approved three contentious, but crucial, new laws long sought by Washington. 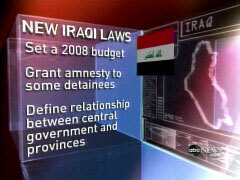 The laws set a budget for 2008, grant amnesty to thousands of detainees and define the relationship between the central government and the provinces." The CBS Evening News and NBC Nightly News on Wednesday night both found time to report on how Secretary of Defense Robert Gates broke his arm in a fall on ice and how, for the first time, a Beagle (named "Uno") won "Best in Show" at the Westminster Dog Show. On Wednesday's Early Show on CBS, co-host Harry Smith discussed the Potomac Primaries with Democratic strategist Dee Dee Myers and Republican CBS political analyst Nicolle Wallace, a former Bush White House Communications Director, who said of John McCain's conservative critics: "The more that we see kind of the crazies like Ann Coulter out attacking John McCain, the better Republicans feel about their chances in the general election." This attack upon conservatives critical of McCain, who include Rush Limbaugh, Sean Hannity, Mark Levin, Laura Ingraham, and others, was prompted by Harry Smith asking about Mike Huckabee's continued support in the race: "Nicolle, let's talk about the Republicans, because McCain, he said himself a week ago, now I'm the frontrunner. This lingering Huckabee thing. Huckabee got a lot of votes in Virginia. These conservatives they're -- they're still -- they're not happy. They're not happy about this guy." Wallace responded: "And, you know what, Republicans are beginning to say that's okay." Smith accepted that assessment: "Oh, okay." Steven Lee Myers' so-called "news analysis," "Trial's Focus To Suit Bush" on Tuesday's front page of the New York Times could have more accurately been labeled "one reporter's anti-war opinion." He asserted: "Mr. Bush never sounds surer of himself than when the subject is Sept. 11, even when his critics argue that he has squandered the country's moral authority, violated American and international law, and led the United States into the foolhardy distraction of Iraq." 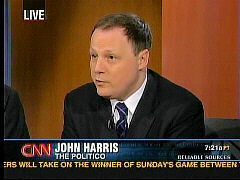 Former Washington Post reporter John Harris, now editor-in-chief of the political newspaper The Politico, engaged in an interesting blog debate Tuesday with his Politico colleagues Mike Allen and Jim VandeHei about whether or not journalists lose their impartiality by voting. Harris insisted that having opinions or voting "does not compromise me as a journalist," and that the key requirement is "self-discipline in the public expression of those opinions so as not to give sources and readers cause to question someone's commitment to fairness." Harris insisted: "As to whether I and other reporters and editors really are fair, the only test of that is the work itself." Over the years, MRC has caught numerous instances in which Harris has seemingly tilted in ways pleasing to either Bill or Hillary Clinton. 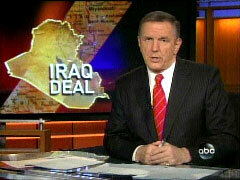 Unlike the Wednesday CBS and NBC evening newscasts, ABC's World News highlighted a favorable development in Iraqi political progress as anchor Charles Gibson gave 20 seconds to: "Overseas, in Iraq, a breakthrough for the country's government that has been so often criticized. Iraq's parliament approved three contentious, but crucial, new laws long sought by Washington. The laws set a budget for 2008, grant amnesty to thousands of detainees and define the relationship between the central government and the provinces." A month ago, on January 14, Gibson was also the only broadcast network evening newscast anchor to cite how "Iraqi lawmakers have put their differences aside and agreed to allow some members of Saddam Hussein's Baath Party to take government jobs. It's a key benchmark sought by the United States." The CBS Evening News and NBC Nightly News on Wednesday night both found time to report on how Secretary of Defense Robert Gates broke his arm in a fall on ice and how, for the first time, a Beagle (named "Uno") won "Best in Show" at the Westminster Dog Show. Gibson, who broadcast from Philadelphia, the site of the dog show, managed to note the development in Iraq as well as Uno's win. 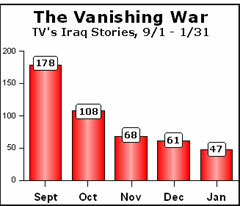 ...over the last five months, the broadcast networks have consistently reduced their coverage of Iraq, as if the story of American success in Iraq is less worthy of attention than their old mantra of American failure in Iraq. HARRY SMITH: Now on to the results of yesterday's primaries. 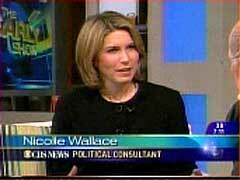 Joining us, Republican strategist and CBS News Political Analyst Nicolle Wallace, and Democratic strategist Dee Dee Myers. Morning to you both. DEE DEE MYERS: Morning Harry. SMITH: Dee Dee let me start with you. Hillary Clinton got crushed yesterday. There was an anticipation that Barack Obama would do well, but there was not a shred of good news that she could pull out of anything that happened yesterday. How does she soldier on out of this? MYERS: It was a very tough night for Hillary Clinton. It's hard to remember that Super Tuesday was just a week ago. You know, a week ago today we were saying, boy, mixed results coming out of Super Tuesday, need to go on. Since then Barack Obama has swept every primary and caucus. He's building up both a substantial -- or sizable, not substantial yet -- but a sizable lead in delegates and in money, and now for the first time I think we see real momentum in this race, and I think the headline for Democrats this morning is for the first time since Democrats started going to the polls and the caucuses, we have a bonafide frontrunner in the Democratic race for president. SMITH: Front -- wow. Dee Dee Myers, you heard it here first. MYERS: You heard it here first. SMITH: Barack Obama's the -- alright, write it down everybody. Nicolle, let's talk about the Republicans, because McCain, he said himself a week ago, now I'm the frontrunner. This lingering Huckabee thing. Huckabee got a lot of votes in Virginia. These conservatives they're -- they're still -- they're not happy. They're not happy about this guy. WALLACE: And, you know what, Republicans are beginning to say that's okay. WALLACE: The more that we see kind of the crazies like Ann Coulter out attacking John McCain, the better Republicans feel about their chances in the general election. WALLACE The McCain camp has tremendous respect for the process. You hear them talk a lot about the process when you ask them about Huckabee continuing to win. But McCain did what he needed do last night. He swept all three contests, and I think acknowledging that Huckabee still has a great deal of support is eventually going to accrue to their benefit, and that they hope to make those supporters McCain supporters. SMITH: In one sentence, If you're Hillary Clinton, what do you do for the next week? WALLACE: I think you've got to fake it. You've to buck up. Act like things aren't as bad as they are. You know, firing your campaign manager, letting the deputy go, those are all things that project weakness. SMITH: And Dee Dee, how about you? If you're -- if you're Hillary Clinton, how do you get -- how do you get the mo back? Real quick. MYERS: Right. You've got to go to Wisconsin next week, campaign hard, and try to win there. She had a great crowd last night in San Antonio, but that's not going to be enough. She needs to win someplace. SMITH: Yeah, it's the Rudy strategy, don't wait until Florida, could be all over. SMITH: Alright. Nicolle, Dee Dee, thank you both very much for being here this morning, do appreciate it. Mr. Bush never sounds surer of himself than when the subject is Sept. 11, even when his critics argue that he has squandered the country's moral authority, violated American and international law, and led the United States into the foolhardy distraction of Iraq. "Six and a half years ago, our country faced the worst attack in our history," Mr. Bush said late last week, speaking to the Conservative Political Action Conference. "I understood immediately that we would have to act boldly to protect the American people. So we've gone on the offense against these extremists. We're staying on the offense, and we will not relent until we bring them to justice." Only a year ago, Iraq appeared to have deflated the president's popularity and eroded his standing even among Republicans and the Pentagon's generals. But Mr. Bush now appears to have laid a foundation to keep more than 130,000 American troops on the ground in a mission he has justified as part of a broader fight against terrorism, despite an overwhelming groundswell against an unpopular conflict. Secretary of Defense Robert M. Gates on Monday essentially endorsed a "pause" in further troop withdrawals once those troops sent in last year as part of a temporary buildup go home. "Critics have called Mr. Bush's ever upbeat message delusional. His rationale for the war has shifted so much since 2003 that any new pitch will have skeptics. His analogy last week between the war in Iraq and the epic struggles of World War II, the Korean War and, especially, the Vietnam War was ridiculed by some as revisionist or simply inaccurate." Former Washington Post reporter John Harris, now editor-in-chief of the political newspaper The Politico, engaged in an interesting blog debate Tuesday with his Politico colleagues Mike Allen and Jim VandeHei about whether or not journalists lose their impartiality by voting. Harris insisted that having opinions or voting "does not compromise me as a journalist," and that the key requirement is "self-discipline in the public expression of those opinions so as not to give sources and readers cause to question someone's commitment to fairness." "As to whether I and other reporters and editors really are fair, the only test of that is the work itself," Harris insisted. I did not vote in either of Virginia's primaries today, though I have been following both the Republican and Democratic contests closely and the Old Dominion's open primary laws would have allowed me to vote in either primary with no obligation to register by party. But my reasons had nothing to do with staying monkishly detached from the election or pretending to myself or others that I have no opinion about the candidates. I have plenty of opinions (though by temperament I tend to wear them pretty loosely). The reason I did not vote is that if I did my name would be on public record showing which primary I voted in. I don't need the hassle of giving people reasons to question or make assumptions about my views or the motives informing my work. I will certainly be voting in the general election, as I have in every presidential race since 1984. I like politics, and I like the feeling of participation as a citizen that voting provides. What's more, coming to a conclusion about whom I support and expressing that in the voting booth does not compromise me as a journalist. My belief is that being a journalist for an ideologically neutral publication like Politico, or the Washington Post, where I used to work, does not mean having no opinions. It means exercising self-discipline in the public expression of those opinions so as not to give sources and readers cause to question someone's commitment to fairness. Moderator Ken Bode: "[Did] the White House say anything about this [accusations Bill Clinton raped Juanita Broaddrick] today?" Washington Post reporter John Harris: "They said it comes -- consider the source. It comes from a very partisan source, the Wall Street Journal editorial page. I think we have to say, in fairness, there have been lots of stories over many years about President Clinton and his personal background. This does not fit the pattern or seem to be consistent with that behavior in any way. So I think we need to be highly skeptical of the story." -- Washington Post reporter John Harris, February 19, 1999 Washington Week in Review. The next morning the Post put its own story about Broaddrick on its front page. # Kind Sir, Why Are You So Hated? "Two and a half years ago in your inaugural, you said you wanted to help the nation 'repair the breach' and this morning, you called again for greater cooperation in Washington. But it seems apparent that for many people you personally remain a polarizing and divisive figure in national politics. I was wondering if you've ever reflected on why, as Mrs. Clinton I think has sometimes noted, throughout your career you've always seemed to generate such antagonism in your opponents and do you assign any responsibility to yourself for what this morning you described as the rancorous mood in Washington today?" -- Washington Post White House reporter John Harris to President Clinton at a June 25, 1999 press conference. "A supportive spouse, surprisingly accepting colleagues, and a mandate to legislate. For Sen. Clinton, life is almost perfect. If only they weren't still out to get her." -- Subhead of Washington Post reporter John Harris's profile, "The Liberation of Hillary," the cover story for the Post's Sunday magazine, January 27, 2002. "They" referred to Clinton's conservative critics. Host Bob Schieffer: "I have always wondered: Do you think that had it not been for Monica Lewinsky and the scandal that was swirling around Bill Clinton, that we as Americans would have recognized earlier what a threat that Osama bin Laden posed? Because every time that Clinton would take action, when he'd fire the missiles at what was supposed to be the terror training camp, people asked, â€˜Is this wagging the dog? Is this something to divert us from talking about Monica Lewinsky?'" Washington Post reporter John Harris: "I think that's the great tragedy of Bill Clinton's record on terrorism, that he understood the threat of Islamic terrorism generally, Osama bin Laden specifically, and yet he was not able to infuse his own government or the country at large with that sense of urgency." -- Exchange on CBS's Face the Nation June 12, 2005, where Harris was promoting his new biography of Bill Clinton.